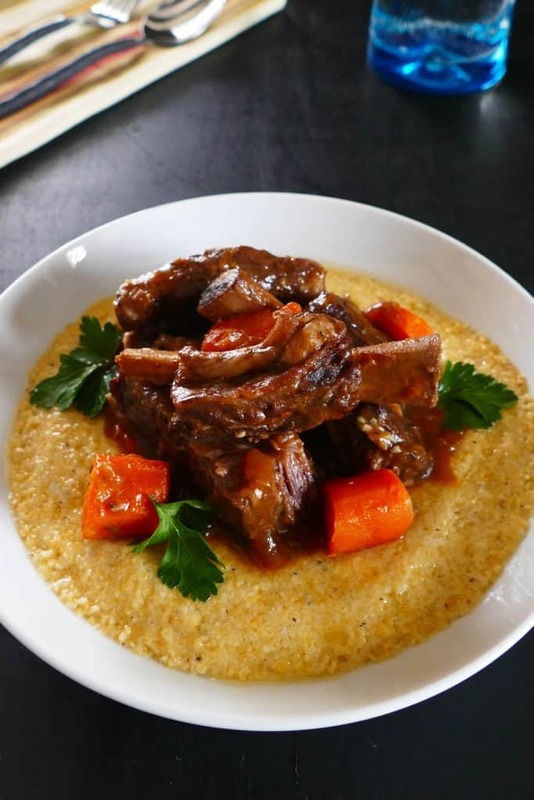 Instant Pot Short Ribs Braised in Red Wine and Guinness is a simple, sophisticated recipe that features fall-apart tender beef short ribs with a rich and flavorful sauce that tastes as though it simmered for hours! I love to serve these beef short ribs over creamy cheese polenta, which is so easy to make in the Instant Pot. 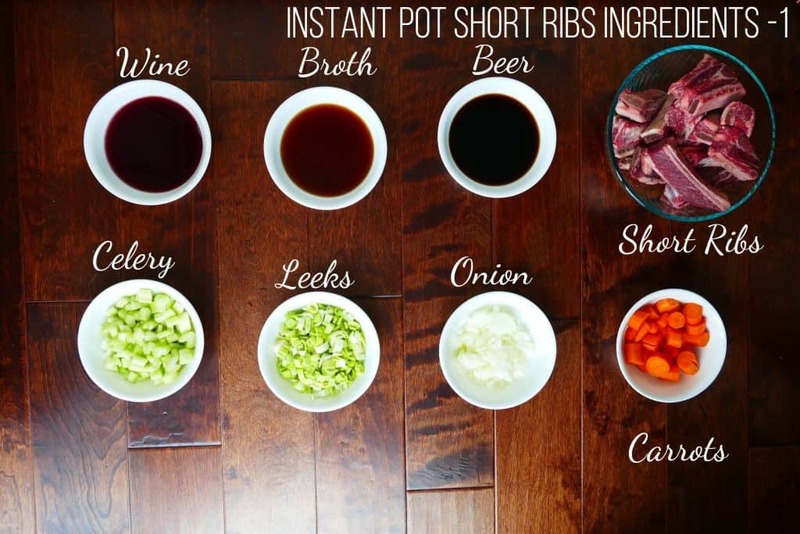 I recently adapted this red wine braised short ribs recipe to the Instant Pot. The original recipe comes from Ina Garten’s newest cookbook Cook Like a Pro: Recipes and Tips for Home Cooks and it was a big hit with my family. I had to make the Instant Pot version of the recipe a few times to get it just right since Ina Garten’s recipe for red wine braised short ribs is cooked in the oven. The red wine and Guinness stout beer impart a complex flavor to these Instant Pot beef short ribs. I love to serve them over polenta. Guinness stout is a really dark beer that has a very strong and unmistakable flavor. I have to confess that I’m not a fan of drinking it but I am a fan of cooking with it! The flavor of the beef short ribs cooking in the Guinness and red wine is rich and robust. Okay, so this isn’t a dump-it-in-and-press-start recipe! 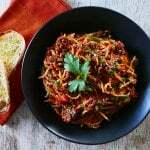 The recipe takes over an hour to prepare (pressure cooking time is 40 minutes with a 15-minute natural pressure release), but the recipe itself is quite uncomplicated. See my tips below to find out an easy way to brown the short ribs – this comes from Ina Garten’s recipe. Leeks can have dirt hidden between the layers. So be sure to clean the leeks very well. I like to use all the white parts and the light green parts but you can even use some of dark green parts because they become soft with pressure cooking. 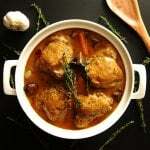 The recipe uses wine and beer, but upon pressure cooking, there will be no alcohol remaining. If you substitute other liquids, the flavor won’t be as complex. in the oven at 425 degrees Fahrenheit. in the Instant Pot on ‘Saute’ mode. I actually prefer doing it in the oven because it’s less messy and it gets done much quicker. I like to deglaze the baking sheet after transferring the short ribs and I add that liquid to the inner pot prior to pressure cooking. Lots of flavor in there! The inner pot should be very hot. The meat will sizzle when added. Don’t overcrowd the inner pot, or the short ribs will end up boiling. That’s why it’s important to work in batches. Sear the meat without stirring, for 1–2 minutes, until nicely browned. Use tongs or a silicone spatula to gently try to release the pieces – if they stick firmly, let them cook some more. Turn the short ribs once they release from the bottom. I highly recommend using a fat/gravy separator to separate the fat from the rest of the liquid. I have a 2 cup version, but I would recommend a 4 cup fat/gravy separator. They’re not too expensive and a worthwhile investment. Remove the solids after pressure cooking and place the liquid in the fridge until the fat rises to the top and solidifies. You can then discard the fat. 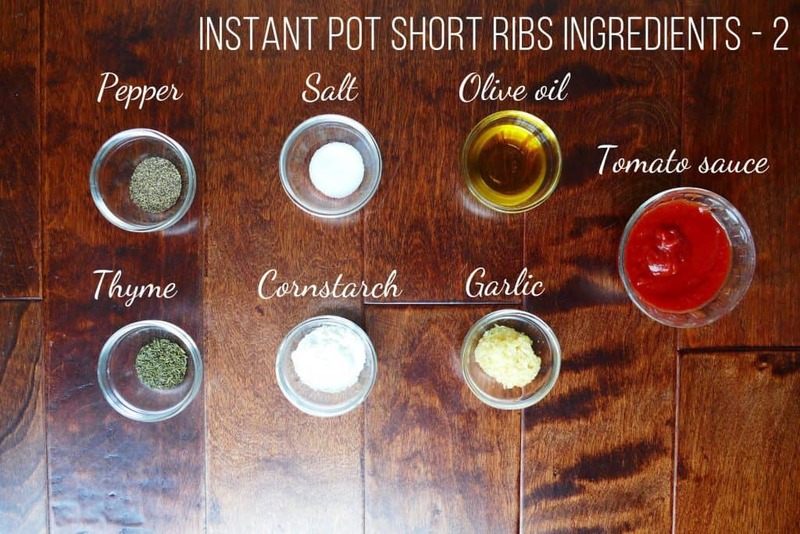 If you’re using this method, you might want to make the Instant Pot short ribs a day ahead and reheat before continuing with the recipe. Use a large ladle or fat skimmer to skim the fat off the top. I don’t know why but I have a hard time doing this although I know many people who use this technique! The bones do add a ton of flavor but if you want to substitute boneless short ribs, decrease pressure cooking time to 35 minutes. Short ribs are an expensive cut of meat. If you want to make this recipe more economical, you can substitute 1 1/2 to 2-inch cubes of beef chuck (trimmed of fat) and pressure cook for 25 to 30 minutes. Serve over Instant Pot Mashed Potatoes or Creamy Polenta. If you’re new to the Instant Pot and aren’t familiar with how to use it, please read the Instant Pot DUO Beginner’s Quick Start Guide or the Instant Pot ULTRA Beginner’s Quick Start Guide first and then come back here to learn how to make these Short Ribs in the Instant Pot. You have two options for browning the beef. You can either bake them on high heat in the oven for 10 minutes or you can brown them in the Instant Pot. I give you both options below. Coat baking sheet with two teaspoons olive oil. Place short ribs on baking sheet, meaty side up and evenly spaced. Transfer short ribs to a large platter. Add a few tablespoons of hot water to the baking sheet and scrape with a spatula to deglaze. Carefully pour drippings into a small bowl and reserve for later. Sprinkle salt and pepper over the meaty side of the short ribs. Once the Instant Pot has pre-heated, heat a tablespoon of olive oil. Transfer the short ribs to a plate, cover lightly with aluminum foil and set aside. Add remaining olive oil to inner pot. Stir in onions, celery, and leeks. Saute till soft, about 1 to 2 minutes. This step should also take care of deglazing the inner pot; there should be no brown bits remaining. * If necessary, deglaze with a couple of tablespoons of broth. Stir to remove any brown bits. Stir in broth, beer, and wine. Add reserved short ribs and carrots to the liquid and push down to submerge. If you browned short ribs in the oven, add in the reserved drippings. Add tomato sauce on top; but don’t stir. 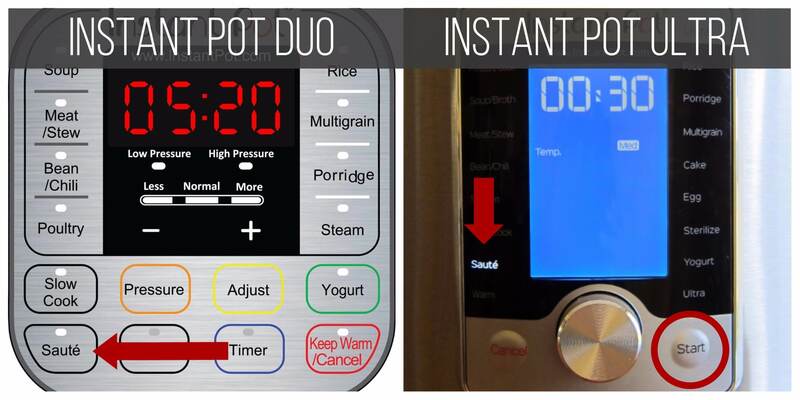 Press ‘Manual’ (or ‘Pressure Cook’) and ‘+’ or ‘-‘ until the display reads ‘40′ (40 minutes). Select Pressure Cook mode and adjust the time to 40 minutes (00:40). The display will count down from 40 to 0; it will then switch to ‘Keep Warm’ mode and display ‘L0:00’ or ’00 00′ and begin to count up. Remove as much of the solids from the inner pot as possible, using a slotted spoon. Separate fat from the liquid. See tips above for details. Stir together the cornstarch and water till they form a smooth paste. Once the liquid is simmering, add in cornstarch slurry. Allow the sauce to cook for another 2 minutes, or until thickened. Add back reserved meat and vegetables and heat through. 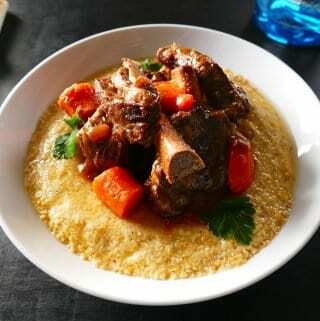 Serve with roasted carrots, and polenta. This Instant Pot Short Ribs Braised in Red Wine and Guinness is a simple yet sophisticated recipe that features fall-apart tender beef short ribs with a rich and flavorful sauce that tastes as though it simmered for hours! I love to serve these beef short ribs over creamy cheese polenta, which is so easy to make in the Instant Pot. Brush with olive oil using a pastry brush. Bake for 10 minutes and use tongs to transfer short ribs to a large platter. Cover lightly with aluminum foil and set aside until ready to add to Instant Pot. Carefully pour drippings into a small bowl and reserve for later, if desired. Transfer short ribs to a large platter. Cover lightly with aluminum foil and set aside until ready to add to Instant Pot. Select 'Saute' mode and add remaining olive oil to the inner pot. Stir in onions, celery, and leeks. Stir in garlic, salt, black pepper, and thyme. If necessary, deglaze with a couple of tablespoons of broth. Stir to remove any brown bits. Stir in broth, beer and wine. Add tomato sauce on top but don't stir. Close the lid and pressure cook for 40 minutes. Wait for 15 minutes after pressure cooking is complete and release remaining pressure. (15-minute natural pressure release - NPR 15). Using a slotted spoon, transfer the solids from the inner pot to a large bowl. Stir together cornstarch and water to form a smooth paste. In 'Saute' mode, heat the contents of the inner pot and gradually add in cornstarch slurry. Simmer the sauce for about 2 minutes, or until thickened. Return reserved meat and vegetables to the inner pot and heat through. Serve with roasted carrots, over polenta, if desired. This sounds really good….but I don’t eat beef!!!! I printed out the recipe anyway maybe some other cut of meat will work with it. Hope your weather is not as bad as the rest of the country is having. Dennis, thanks for commenting – too bad you can’t make the recipe with beef, but maybe another type of meat might work – not sure how it would be. Let me know! Nope, not as cold here – thank goodness! I made this with pork short ribs. I made it the day before which enhanced the flavor and thickened the sauce. The next day I heated it up by pressure cooking it for 1 minute. I also served it with Haitian-style polenta and steamed broccoli. The meal was subtle in flavor and quite tasty. The texture of the meat was perfect. Fell right off the bone. I’ll definitely make this again. 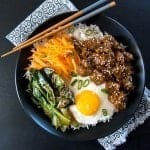 Out of curiosity, is there a way to make this recipe without the beer? My husband has celiac and cannot have gluten. Since both barley and wheat contain gluten, beers made from either are not gluten-free. Thank you in advance.